Nationality: Japanese. Born: Hokkaido, 4 February 1916. Education: Educated in Oriental art at Waseda University, Tokyo, 1933–41. Military Service: Drafted into military service, served in Manchuria, 1942–44; following his refusal to be promoted above rank of private as expression of opposition to conduct of war, transferred to Ryukyu Islands, 1944, then interned in detention camp on Okinawa. Career: Assistant at Shochiku's Ofuna studios for 8 months prior to military service, 1941; returned to Shochiku, 1946; assistant director on staff of Keisuke Kinoshita, 1947–52; directed first film, 1952. Awards: Recipient, Special Jury Prizes, Cannes Festival, for Seppuku , 1963, and for Kwaidan , 1965. Died: 4 October 1996, in Tokyo, Japan, of cardiac arrest. "Harakiri, Kobayashi, Humanism," interview with James Silke, in Cinema (Beverly Hills), June/July 1963. "Cinq japonais en quête de films: Masaki Kobayashi," interview with Max Tessier, in Ecran (Paris), March 1972. Interview with Joan Mellen, in Voices from the Japanese Cinema , New York, 1975. Interview with A. Tournès, in Jeune Cinéma (Paris), April 1985. Interview with G. Bechtold and A. Meyer, in Filmfaust (Frankfurt am Main), January-Feburary 1987. Interview with H. Niogret, in Positif (Paris), December 1993. Bock, Audie, Japanese Film Directors , New York, 1978; revised edition, Tokyo, 1985. Blouin, Claude R., Le Chemin détourné: Essai sur Kobayashi et le cinéma Japonais , Quebec, 1982. Richie, Donald, "The Younger Talents," in Sight and Sound (Lon-don), Spring 1960. Iwabuchi, M., "Kobayashi's Trilogy," in Film Culture (New York), Spring 1962. Esnault, Philippe, "L'Astre japonais," in Image et Son (Paris), February 1969. Kobayashi Section of Cinéma Québec (Montreal), February/March 1974. Tucker, Richard, "Masaki Kobayashi," in International Film Guide 1977 , London, 1976. "Masaki Kobayashi," in Film Dope (London), January 1985. Gillett, John, "Masaki Kobayashi: Power and Spectacle," in National Film Theatre Booklet (London), July 1990. Niogret, Hubert and Eithne O'Neill, "Masaki Kobayashi," in Positif (Paris), December 1993. Gräfe, Lutz and Olaf Möller, "Die Ethik der nackten Klinge," in Film-Dienst (Cologne), 28 February 1995. Obituary, in Variety (New York), 21 October 1996. Obituary, in Séquences (Haute-Ville), November/December 1996. Obituary, in EPD Film (Frankfurt), December 1996. Obituary, in Film en Televisie + Video (Brussels), December 1996. Minks, Patrick, "Masaki Kobayashi (1916–1996)," in Skrien (Am-sterdam), December-January 1996–1997. The dilemma of the dissenter—the individual who finds himself irrevocably at odds with his society—is the overriding preoccupation of Kobayashi's films, and one which grew directly from his own experience. In 1942, only months after starting his career at Shochiku studios, Kobayashi was drafted into the Imperial Japanese Army and sent to Manchuria. A reluctant conscript, he refused promotion above the rank of private and was later a prisoner of war. Released in 1946, he returned to filmmaking, becoming assistant to Keisuke Kinoshita, whose flair for lyrical composition clearly influenced Kobayashi's own style—though he succeeded, fortunately, in shaking off the older director's penchant for excessive sentimentality. subject so sensitive that the film's release was delayed three years; corruption in sport in Anata kaimasu ; and, in Kuroi kawa, organized crime and prostitution rampant around U.S. bases in Japan. This phase of Kobayashi's career culminated in his towering three-part, nine-hour epic, Ningen no joken , a powerful and moving indictment of systematized brutality inherent in a militaristic society. The ordeal of the pacifist Kaji, hero of Ningen no joken (played by Tatsuya Nakadai, Kobayashi's favorite actor), closely parallels the director's own experiences during the war. Kaji is the archetypal Kobayashi hero, who protests, struggles, and is finally killed by an oppressive and inhumane system. His death changes nothing and will not even be recorded; yet the mere fact of it stands as an assertion of indomitable humanity. Similarly, the heroes of Kobayashi's two finest films, Seppuku and Joiuchi , revolt, make their stand, and die—to no apparent avail. In these films Kobayashi turned the conventions of the jidai-geki (period movie) genre to his own ends, using historical settings to universalize his focus on the dissident individual. The masterly blend of style and content, with the unbending ritual of samurai convention perfectly matched by cool, reticent camera movement and elegantly geometric composition, marks in these two films the peak of Kobayashi's art. 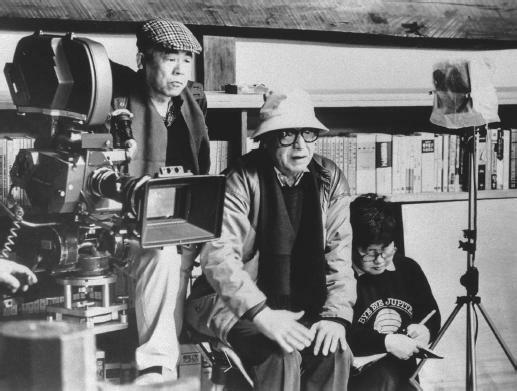 By Japanese standards, Kobayashi made few films, working slowly and painstakingly with careful attention to detail. From Seppuku onwards, an increasing concern with formal beauty characterized his work, most notably in Kaidan. This film, based on four of Lafcadio Hearn's ghost stories, carried for once no social message, but developed a strikingly original use of color and exquisitely stylized visual composition. The crisis that overtook Japanese cinema in the late 1960s hit Kobayashi's career especially hard. His uncompromising seriousness of purpose and the measured cadences of his style held little appeal for an industry geared increasingly to flashy exploitation movies. Few of his projects came to fruition, and Kaseki had to be made first for television, a medium he disliked. He refused to watch the eight-hour TV transmission, regarding it merely as rough footage for his 213-minute cinema version. Kaseki , in which a middle-aged businessman confronts the prospect of incurable cancer, seemed to mark a move away from Kobayashi's wider social concerns—as did the far weaker Moeru aki. Tokyo saiban , though, found him back on more characteristic ground. A tour-de-force of editing, it used archive and newsreel footage to make compelling drama of the Allied trials of Japanese wartime leaders. With Shokutaku no nai ie , his final film, Kobayashi returned to his central preoccupation, with a principled individual (Nakadai once again) standing out against daunting social pressures. Though lacking the impact of Ningen no joken or Seppuku , it evinced his undiminished skill in exploiting the tension between outward formality and inner turmoil and reaffirmed the austere integrity that informed all his work.